9ct Yellow Gold. Ring is UK Hallmarked for solid 9ct Gold. Diamond Ring. Size N (uk) - 6 1/2 ( usa) Ring sizing details Below . Ring sizing service available, at cost price of £25.00. Diamond has been tested to confirm it is natural. This sale is for a stunning 18ct Yellow gold 0.50ct Brilliant cut Diamond solitaire ring. The Brilliant cut diamond being 8 claw set to coronet gallery with wide shoulders is of excellent quality. If you are in any doubt I am happy for you to buy and ring and once you are happy that it is the ring for you, you can send it back to be sized. 18ct Yellow gold. Ring is UK Hallmarked for solid 18ct Gold. Diamond ring. Size K (uk) - 5 1/8 ( usa) Ring sizing details Below . Ring sizing service available, at cost price of £20.00. -Established family run jewellers with over 12 years of Experience. 9ct White gold. Ring is UK Hallmarked for solid 9ct Gold. Diamond Ring. Size M (uk) - 6 ( usa) Ring sizing details Below . Ring sizing service available, at cost price of £25.00. Diamond has been tested to confirm it is natural. Platinum and diamond solitaire ring. Princess cut diamond. Approximate diamond weight 0.50ct. Great ring. MORE DIAMOND RINGS. Finger size I 1/2. Suitable for resizing. With expertise of traditional skills in. This sale is for a stunning 18ct White gold 0.20ct Diamond solitaire ring. The Round brilliant cut diamond being set with cross over shoulders is of excellent quality. The ring is fully hallmarked and shows the assay office as Sheffield. 18ct White gold. Ring is UK Hallmarked for solid 18ct Gold. Diamond ring. Size N (uk) - 6 12/ ( usa) Ring sizing details Below . Ring sizing service available, at cost price of £25.00. Diamond is of outstanding quality & has been tested to confirm it is natural. Tiffany and Co Diamond Platinum Ring 0.33ct. Setting Type : Claw Setting. Diamond Carat : 1.01 Carat. Hatton Garden Jewellery Quarter, London. This ring is also available in Platinum, 18K White, Yellow and Rose Gold. Diamond Shape : Round Brilliant. Stunning natural white diamond set in a fine 18k white gold ring. 0.48ct diamond with F colour and SI2 clarity. So very white and only slightly included. Photos taken at 20x zoom to show the real quality of the item so may be smaller than it looks. RRP: £1675. Materials: Platinum. Diamond: 0.34 carats. Item Type: Ring. Ring Size: I. Polish: Very Good. The four princess cut diamonds are clear and sparkly, and there is 0.15 carat weight of diamond in the ring. The setting is 5 mm square, and the ring sits 5 mm tall on the hand. The ring is fully hallmarked on the inner band and it weighs 2.3 grams. Beautiful engagement ring for sale, only selling because I am no longer engaged, was originally purchased for £1500. The Clarity Grade of the Centre Stone is VS1. The Centre Stone has a Carat weight of 1.20 Carat. The Colour Grading of the Centre Stone is H. The Band is 1mm of Gauge and has split shoulders. Clarity - VS2. Paste link into a browser window:[isdntekvideo]. Video will open in a new window. Carat weight - 1.01. Weight - approx 6.0g. Size - K (UK). 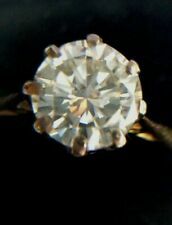 18ct white gold diamond engagement ring size p. Condition is New without tags. Dispatched with Royal Mail 1st Class (1 to 2 working days). With 750 (18ct) as the pictures show. A stunning 0.51ct Princess Cut Diamond -. Estimated to be F in Colour and VS1 in Clarity. 1.7mm wide. and the setting of the ring will sit 5.0mm in height. The ring is a Size J ½ (re-sizing available). 9ct Yellow & White gold. Ring is UK Hallmarked for solid 9ct Gold. Diamond Ring. Size M (uk) - 6 ( usa) Ring sizing details Below . Ring sizing service available, at cost price of £19.50. Diamond has been tested to confirm it is natural. If needed we can resize the ring shank. EARTH MINED DIAMOND. 14K WHITE GOLD 1.95g. Diamonds without these birthmarks (inclusions) are rare, and rarity affects a diamond’s value;. GEM GENERAL INFORMATION. Over quarter of a carat at 0.29 carats with this bright dancing certified diamond is a real joy! There is a full British hallmark showing '950' for Platinum. CARAT WEIGHT Delightful brilliant cut diamond. Purity & stone content:platinum setting with 14ct yellow gold shank 0.50ct Brilliant Cut, Colour E, clarity Vs1. Find us in the photo's for a superb deal and a friendly honest service. Financial Conduct Authority. It is set in a beautifully 4 claw mount which sits 8mm off the finger and leads onto the thick solid platinum ring which weighs a solid 6.2 grams altogether. Exquisites is our new range of the very high quality pieces. Hatton Garden Jewellery Quarter, London. This ring is also available in Platinum, 18K White, Yellow and Rose Gold. Diamond Carat : 1.00 Carat Ring Size : H, I, J,K, L, M, N, O, P. DIAMOND JEWELLERY. 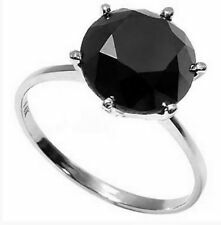 Diamond Color : Black. Setting Type : Claw Setting. Hatton Garden Jewellery Quarter, London. This ring is also available in Platinum, 18K White, Yellow and Rose Gold. Diamond Shape : Round Brilliant. DIAMOND JEWELLERY. Beautiful diamond solitaire engagement ring. Pictures do not do it justice. Fully hallmarked. This stunning light Grey diamond is 100% natural (not modified or enhanced) and was cut in the Victorian era (when most Old mine cut diamonds were cut). The Grey colouration is NOT to do with any inclusions within the stones as it is exceptionally clear as can be seen from the photos (especially the photo of the rear of the stone) and is a superbly high quality diamond indeed (VVS2!). 18CT Hall Marked White Gold, WT.3.87 Grams. International Confederation of Jewellery, Silverware, Diamonds, Pearls, and Stones (CIBJO). IGI ( International Gemological Institute ) Certificate. Laser scribed IGI Identification Number. Clarity Grade: VS1. Total Carat Weight: 0.50 carat. Platinum British hallmark (). Type: Diamond.